St Edith's church in Bishop Wilton is known as The Queen of the Wolds. 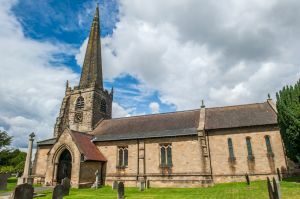 It is a Norman church, much remodelled by JL Pearson for Sir Tatton Sykes in the mid 19th century, one of 17 Sykes Churches across the Yorkshire Wolds. 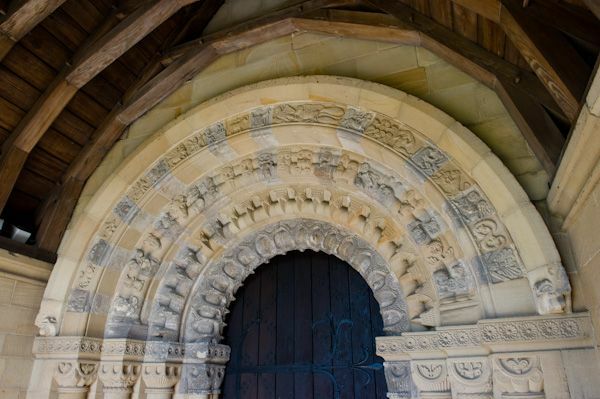 The most striking feature of St Edith's is the late Norman south doorway arch, paid for by Archbishop Grey (1216-1255). The Archbishop built a palace in this delightful Wolds village, in the process adding the 'Bishop' to the name. The remains of the palace can be seen as scanty earthworks in fields east of the church. 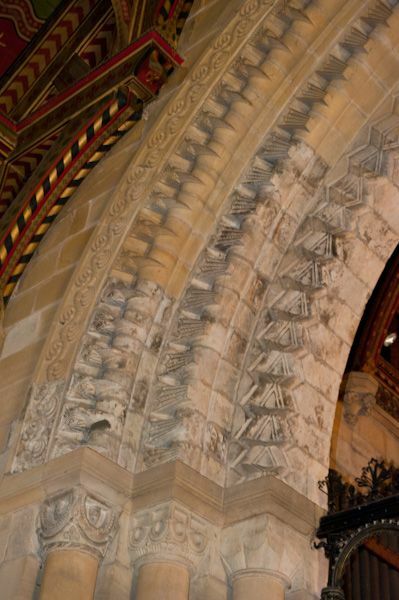 As for the doorway arch, it is quite remarkable (despite, or perhaps, because of, the well-intentioned Victorian restoration). 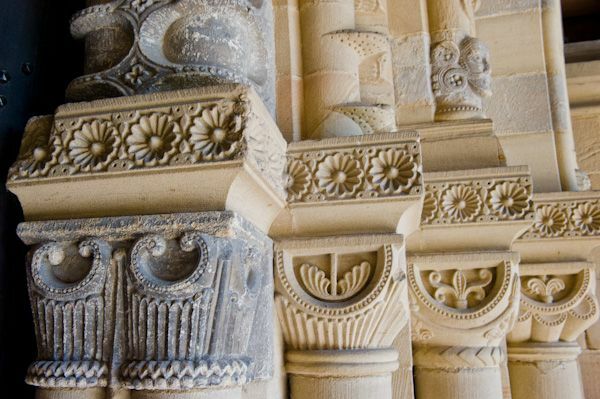 I usually have very little good to say about Victorian 'restorers', but in this case, the restoration was done with much sympathy, and in some places it is impossible to say where Norman work stops and Victorian work begins. 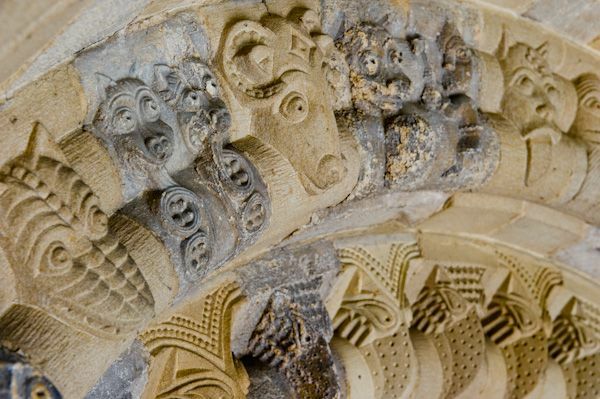 The arch is decorated with traditional Norman themes, including beak heads. 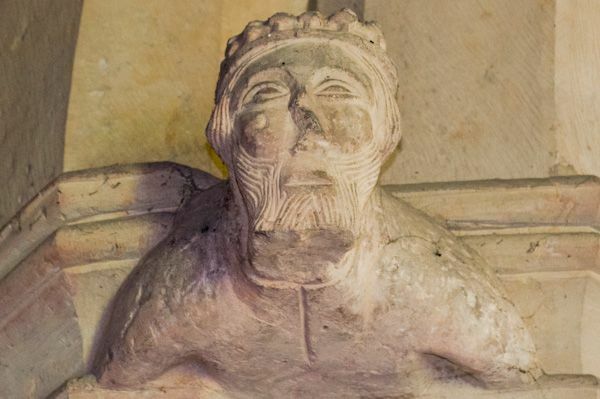 Christ is at the keystone position, while under him is a pagan being eaten head-first by a demon. Ouch! 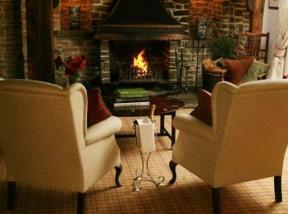 There are further traditional symbols such as a mermaid (lust), moneybags (greed), and animals eating (gluttony). There is also a figure of David with the head of Goliath. The windows and decorated ceiling were crafted by Clayton and Bell of London, who frequently worked for Sykes. 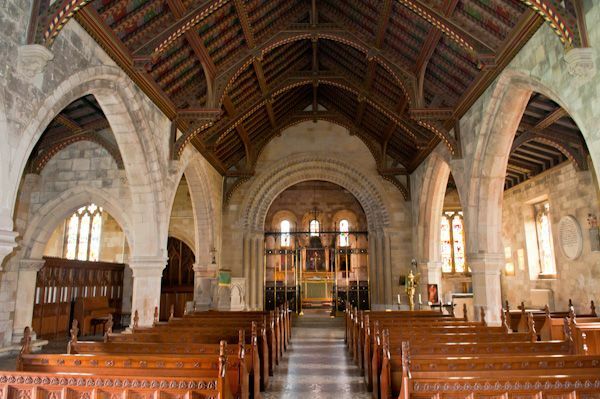 The chancel is Norman, separated from the nave by a lovely ironwork screen designed by GE Street. 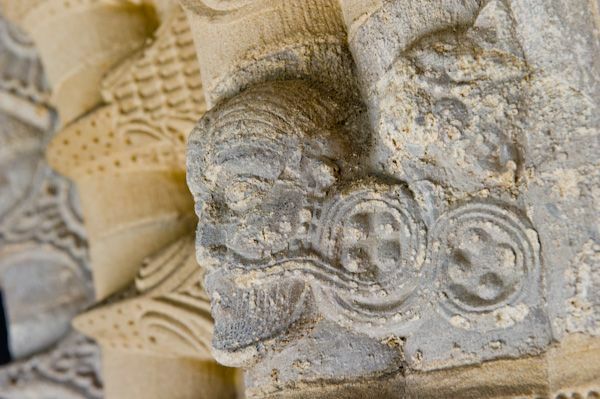 The chancel arch shows further Norman ornamentation including beakheads and zigzag carvings. 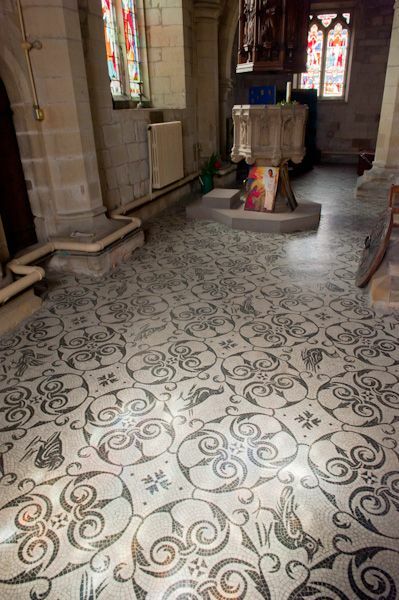 The other notable feature of St Edith's is the tiled floor, which is a copy of the floor pattern in a section of the Vatican in Rome. It's a very striking geometric pattern, and when the light falls on it from the richly coloured Victorian stained glass windows the effect is mesmerizing.